In their natural state, Long Hots look quite a bit like an Anaheim pepper, but with rather more heat. I have heard that the Long Hot is really a Hungarian Wax Pepper but haven’t had much luck finding either locally – and the attempt to grow wax peppers was a dismal failure (although that was likely operator error – I’m much more adept at eating food than growing it). Like most peppers, these pack a wallop of vitamin A and pair nicely with the firm creaminess of butter beans, which are a type of large white lima bean used often in Southern cooking (AND a boxer – not to be confused when you googling). 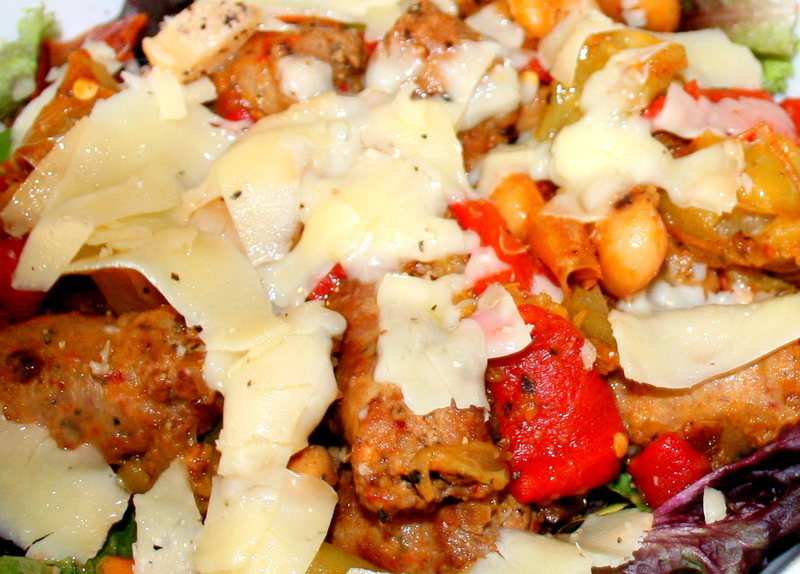 Considered a “fiber all star,” the butter bean is high in fiber and protein, relatively low in carbs, and quite low in fat, making it a good filling fit for many diets (and also dang tasty to boot). 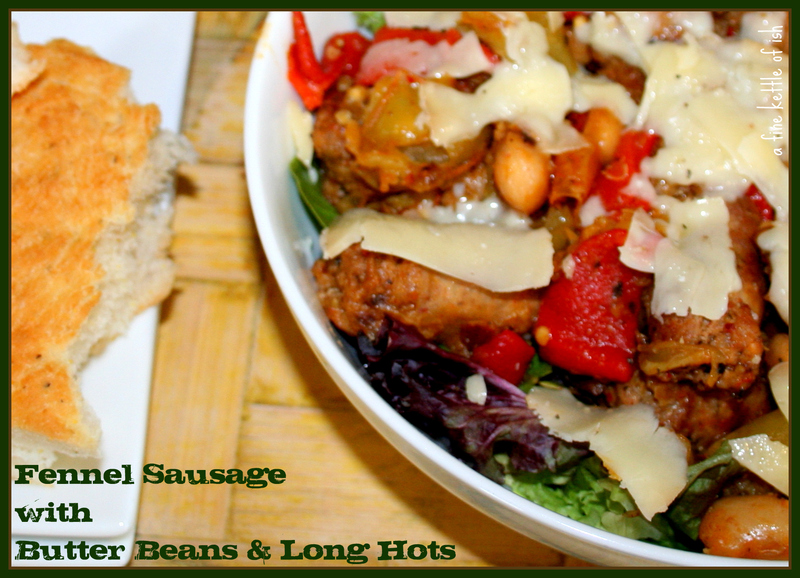 To cook up this bounty, all you need to do is brown 1 lb of hot italian sausage in a skillet, throw in a drained jar each of butter beans and long hots (and a clove or three of minced garlic if you like), and cook over medium heat until the sausage is cooked through. I served the whole thing over a bag of baby herb salad (any dark lettuce or spinach blend would probably do) with shaved parmesan on top and a bottle of Barolo on the side. If you aren’t in San Diego (good luck with Snowpocalypse 2011) and want to order a jar of Long Hots or two, you can try to order here – I’m sure creative googling will provide other options as well. 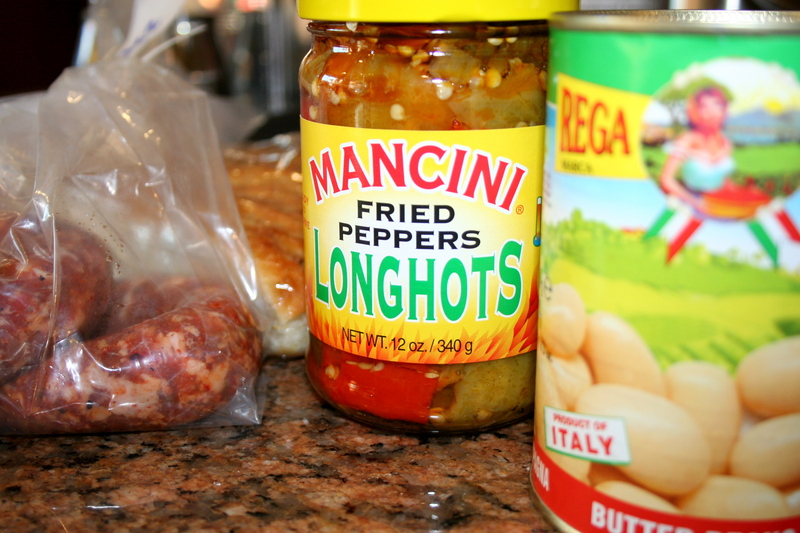 Otherwise, you can buy the Mancini Long Hots (as well as fresh sausage, butter beans, and more) at Mona Lisa’s in Little Italy. Why not make an outing of it and go this Saturday during the Little Italy Certified Farmers’ Market on Date street from 9am-1:30? …Did I lose you at lima bean? Give the butter bean a chance! How many other beans have this kind of passion dedicated to them?